A group of KC Metro students is working to lower suspension rates in school by lowering the suspension on cars. And the teens have now teamed up with local police to make it happen. OLATHE, Kan. — A group of KC Metro students is working to lower suspension rates in school by lowering the suspension on cars. And the teens have now teamed up with local police to make it happen. Adrian Vilches, also known as "Shorty," sat down with 41 Action News to discuss a tall task. His mom was even in a state of shock over this. "Honestly she started crying. She didn't believe I would make it to work with cops in this kind of way," Vilches said. Vilches and several other teens expressed excitement over a new partnership with the Olathe Police Department. Erik Erazo is the brainchild behind this club. He currently serves as the Migrant Director and Hispanic Student Advisor for the Olathe School District. “We started a club in 2016 with a few lowrider bikes we were building,” Erazo said. Erazo said that’s how the Olathe Lowrider Bike Club got off the ground. The students spend a few hours a day, every week turning bikes into something much more. They did such a good job “tricking out” the bikes, the Olathe Police Department got in on the fun. The department donated an old squad car to be converted into a lowrider. Vilches agrees that the program offers so much for the students. “If I didn’t have the program, I’d probably be doing something dumb right now. Probably in the back of a police car, but now this is what keeps me moving forward," said Vilches. Christian Gutierrez is another student who sees the many benefits of the program. In addition to learning about cars, he’s also building a relationship with police he never imagined possible. The teens have placed their work on display at car and bike shows across the KC Metro. They eventually want to help and donate to other kids in need. Perhaps what’s most impressive is that every high school senior in the program last year graduated and is now in college. It’s a program the Olathe Police Department wants to continue for several years. 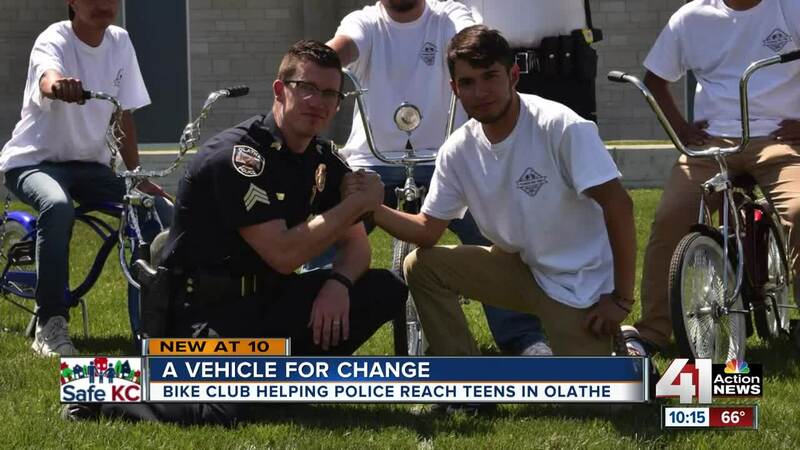 Materials used for the Lowrider Club are funded by donations via the Olathe Police Foundation. If you’d like to help out, click here.